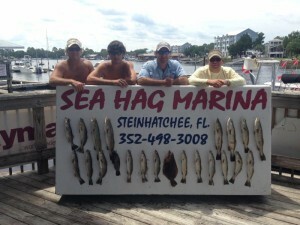 It’s been a great scallop season at Sea Hag marina, and it’s not over yet…and won’t be until September 24th. The water has been amazingly clear and limits have been coming in to the cleaning tables every day. And now that school has started, the water is not as crowded. Additionally, as I mentioned last month, the scallops have been particularly large this year, and have been showing up now to the south, especially in the Sink Creek/Tater Island areas. Scallops are being found a little lower in the water. Some years they are easily seen, up in the grass after the sun comes up. This year, a significant percentage of the scallops are partially buried, so work an area slowly and don’t be afraid to root around in the sand and mud with your hands if you see something that looks like the very top of a scallop shell. The largest scallops have been more likely to be buried so it’s worth the time. 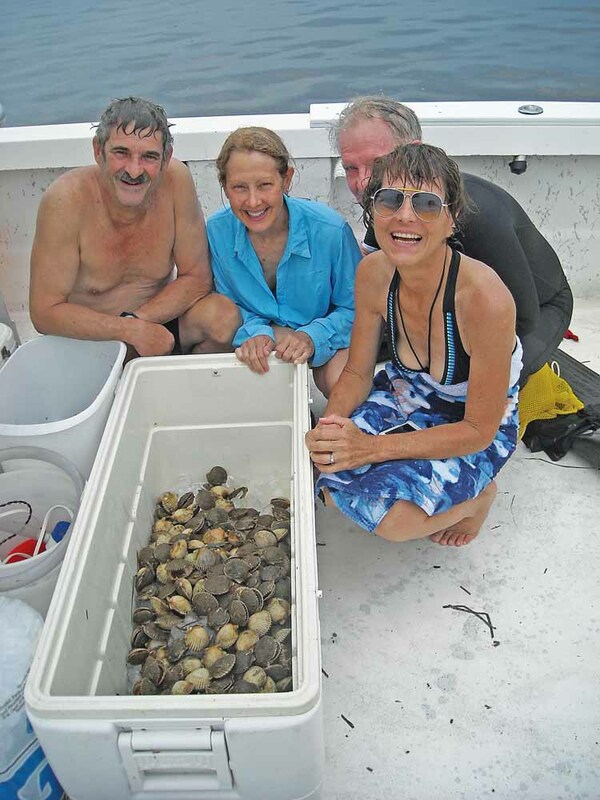 And just like last month, a reminder: your single limit is 2 gallons per person of whole shells….or 1 pint of cleaned meats, with a boat limit of 10 gallons whole shells or ½ gallon of cleaned meats. Given the large size, if you intend to clean them yourselves, it may be worth your while to clean scallops on the water, which will net you more scallop meat. 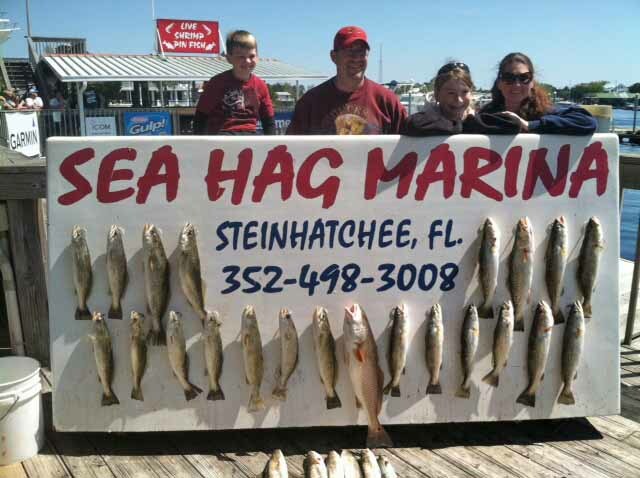 Fishing has been inconsistent inshore, although some nice trout limits have been taken. 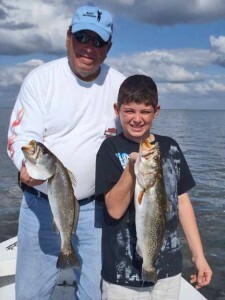 Trout have been in deeper water, with occasional larger fish taken in close; however, I fished the last weekend of the month and found some nice keeper fish in 3 feet of water in areas with potholes and mixed bottom. 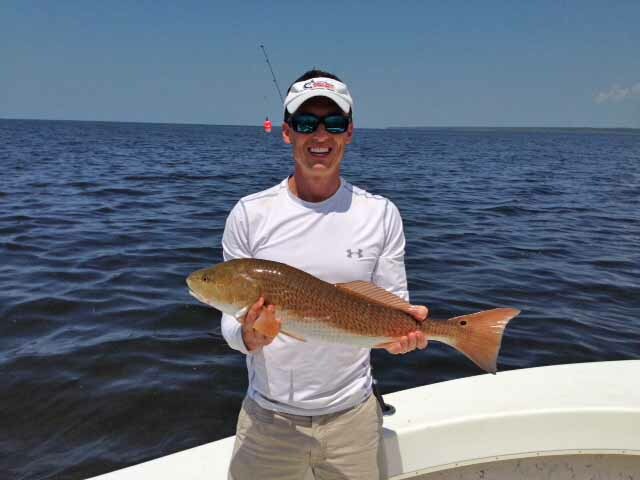 Redfish have actually begun to school, with some schools located near creek mouths. 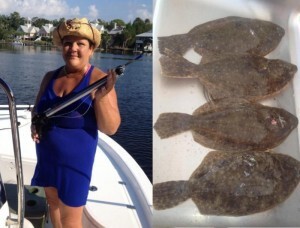 Some nice flounder catches have been made as well; while summer fish are not huge, they are running in the 2 to 4 pound range. 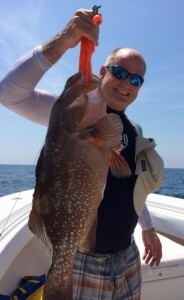 Offshore, red and gag grouper have been available in 70 feet of water or deeper. 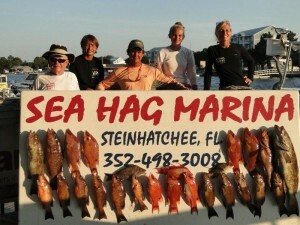 Many fine hog snapper and grouper have been brought in on spearfishing trips. 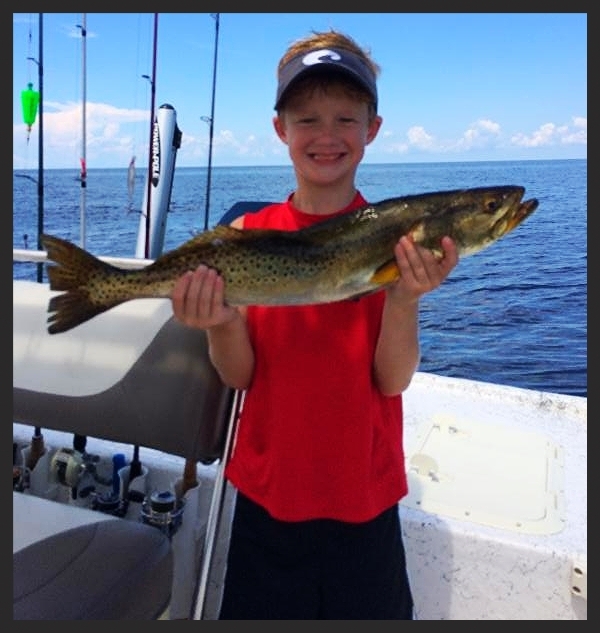 Mac McCall and his friends from Macon found these excellent trout in deeper water. 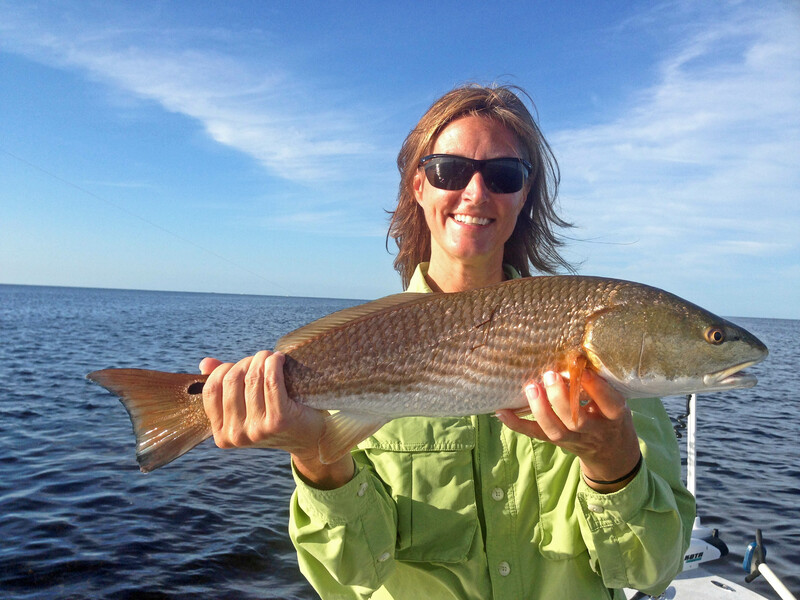 Marlea Gates-Markey from Steinhatchee got her first red of the year. 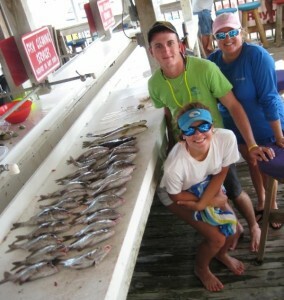 Our hosts, the Norwood family, show us how spearfishing is done in the Big Bend. Robin Padgett brought home an excellent flounder dinner. 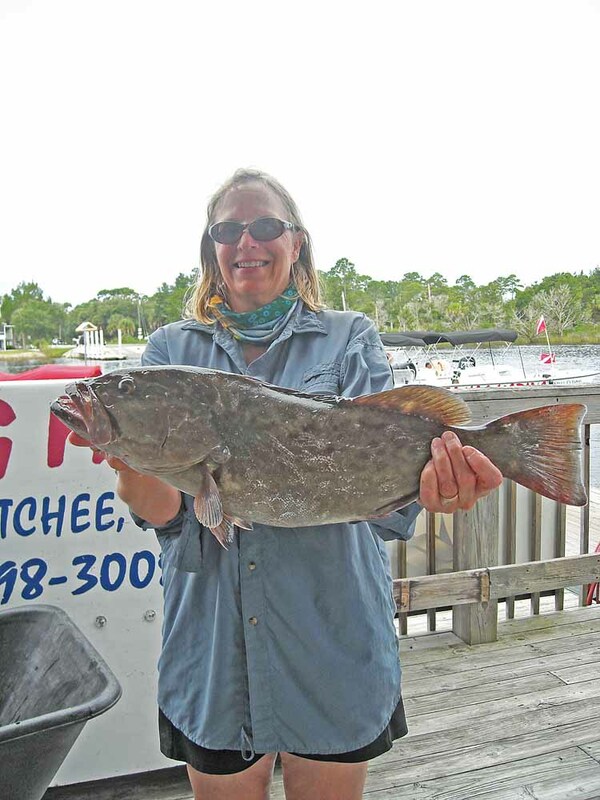 Caroline Jordan from Jacksonville with a giant red grouper. 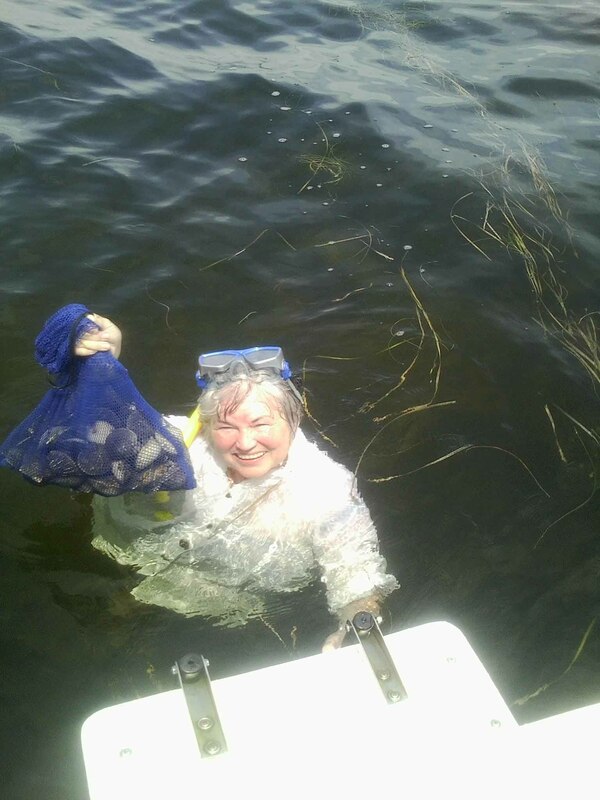 Jennifer McRee enjoying a cool dip and some large scallops. The scallop meats this year are way above average. 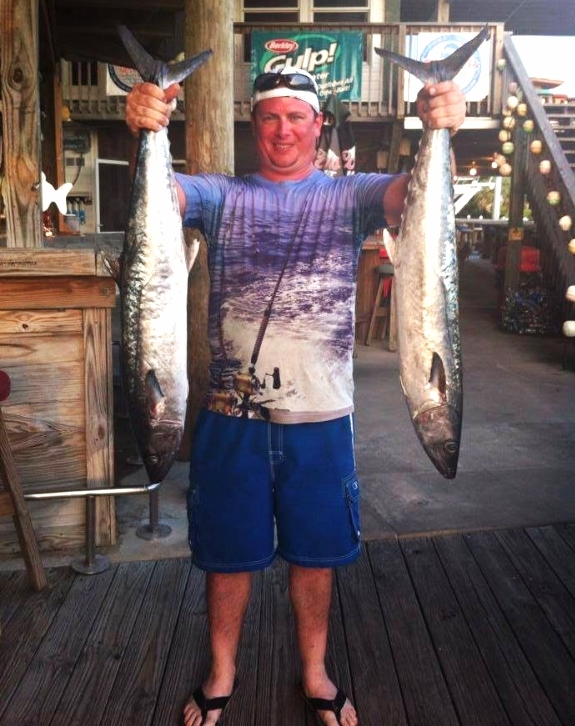 Jason Boan was trolling sardine minnows and happened onto this nice pair of kingfish. Brady Shaw caught this huge 26 inch gator trout fishing with this dad, Sam. 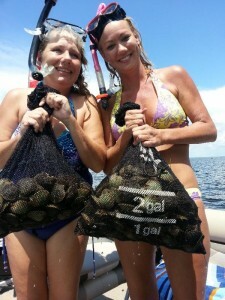 Margaret Giddens from Nashville, Ga. and Susan Aguado from Defuniak Springs got easy limits of scallops. 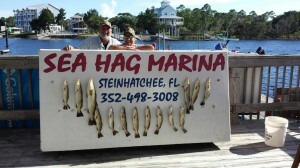 Roger Swanger from Gainesville with several grouper dinners. The Lawson family from Clermont got plenty of fine eating Florida snapper. Ron and Russ Poppel finished first in the Sea Tow Elite Redfish tournament at the Sea Hag Marina. I’m really looking forward to some more moderate temperatures and the gradual clearing of the inshore floating grass. 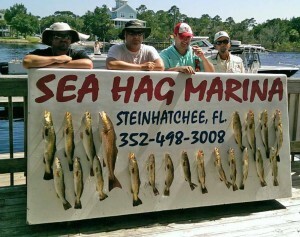 Additionally, in the last week or so, some fine catches of sand trout have been brought in. Redfish will continue to school, with things really picking up in the middle of the month. 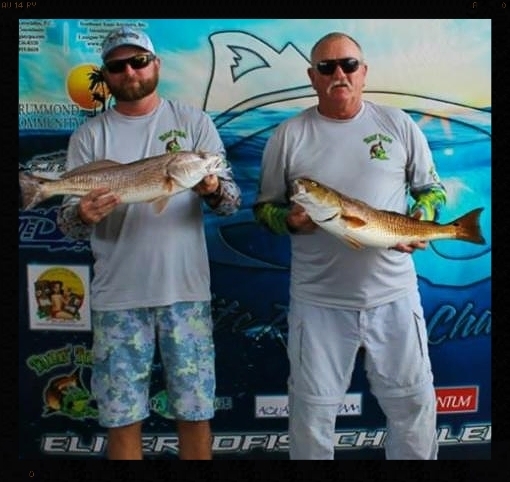 Fishing with gold spoons or soft jerkbaits is just about required until the floating grass decreases, but then jigs, topwater baits or crankbaits will be the ticket. Trout will remain in deeper water, 6 feet or deeper. Fish with jigs and Gulp baits. 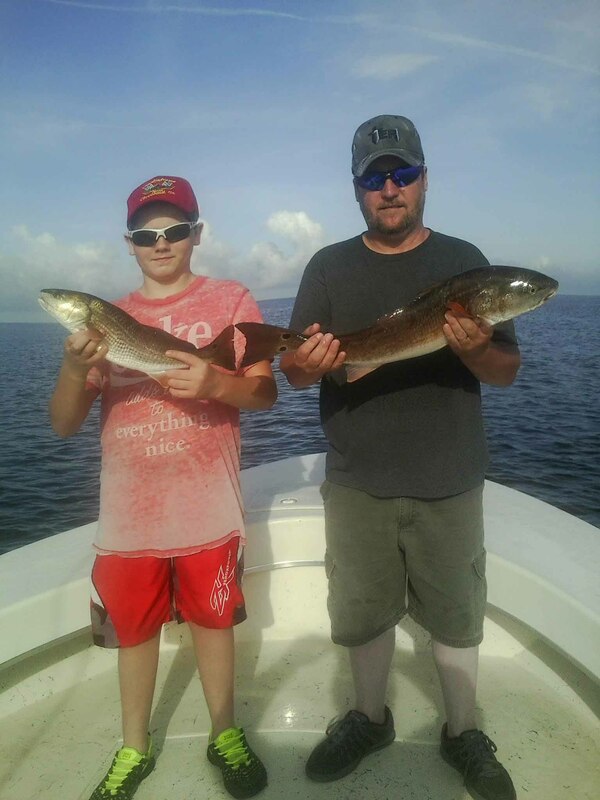 Schools of whitebait have gradually been increasing, and fishing on the sand bars north of the river has been productive for both scalloping and trout fishing. 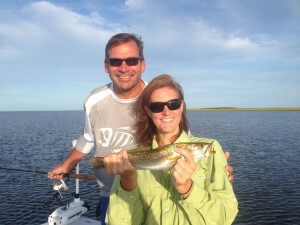 Additionally, with the influx of whitebait, some nice catches of bluefish and Spanish mackerel can be had at areas like Little Bank, the 9-Mile Bank, and the large sand bar offshore of Bull Cove, south of the river. Offshore, watch for kingfish to pick up as the water cools. Cobia will begin migrating back through our area, initially on nearshore structure in 25 to 30 feet. Live bait will continue to work well for offshore fishing, but there are times when frozen squid or sardines will outproduce live bait. Finally, if you haven’t done a scallop trip this year, now is the time. 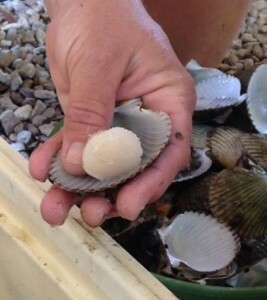 The scallops are larger at the end of the year, the crowds are less, and temps a little more reasonable. 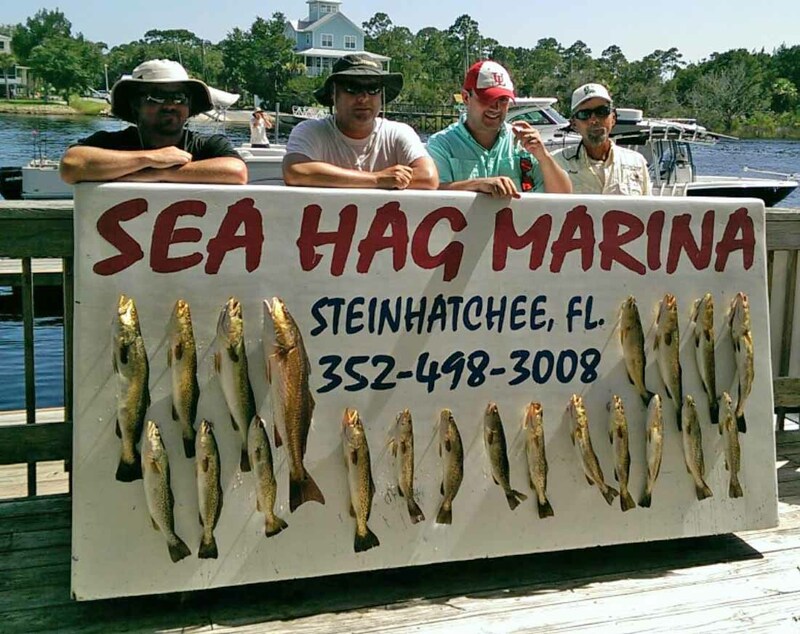 Remember that you can rent one of the Sea Hag Rental boats for a reasonable price, and that you need a saltwater fishing license to scallop, along with masks, fins and a snorkel. All of these items are available at the Ship’s Store to make things easy. If you are coming for a few days, and aren’t familiar with the area, consider getting a guide to show you the ropes. 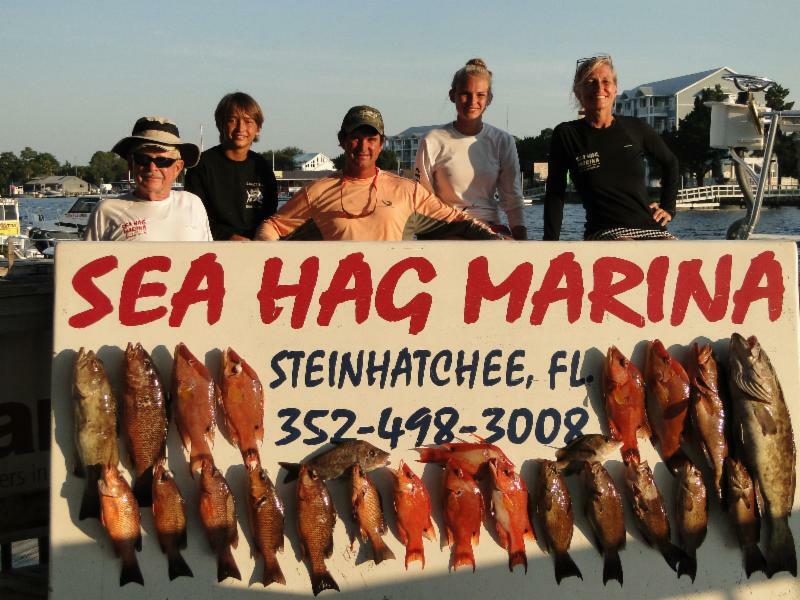 Most of our guides will do half-day fishing and half-day scalloping trips. 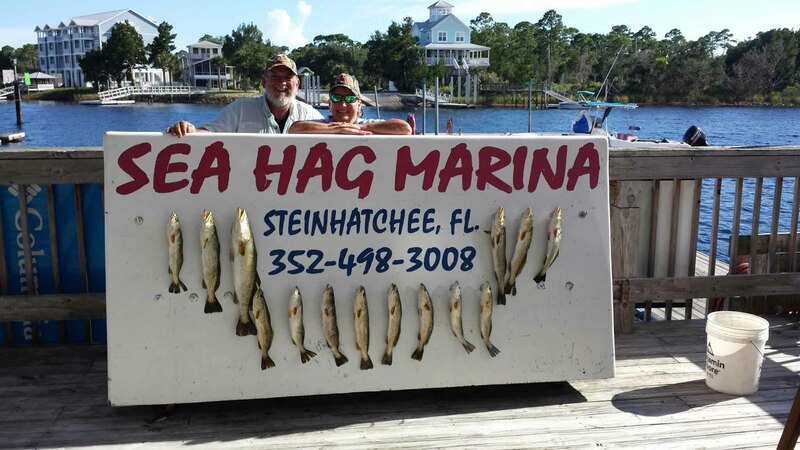 Regardless of how you decide to explore our waters, the Sea Hag is the place to go for everything you need, including accommodations, so give us a call. It sure has been a very good scallop season and should continue that way until the season ends. STILL RUNNING MY SPECIAL ON SCALLOP TRIPS DURING THE WEEK. Most boats are getting plenty but you have to work a little bit to find them. 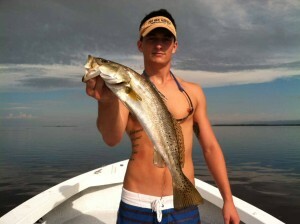 Trout fishing on the flats has been good to very good fishing shallow early and deep when it gets hot. 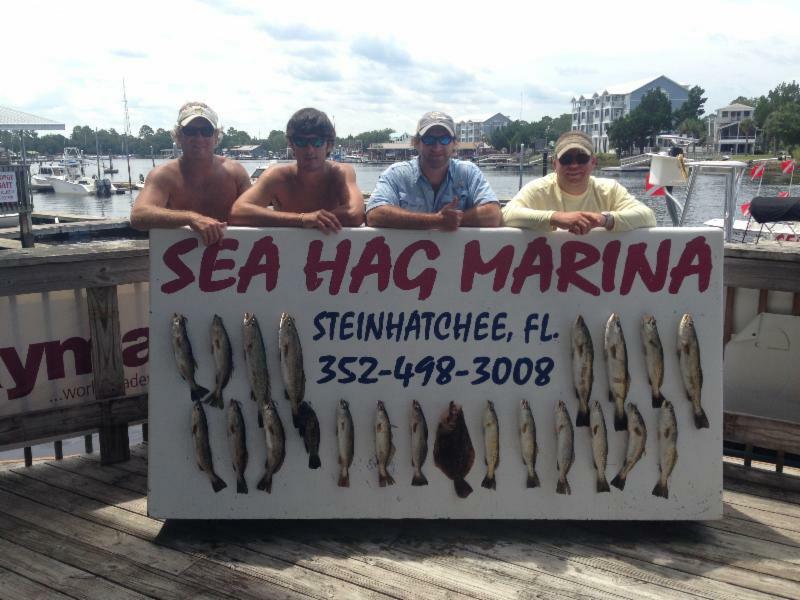 Still catching a few Spanish around the sand bars when the bait is on top and even some keeper sea bass below them. 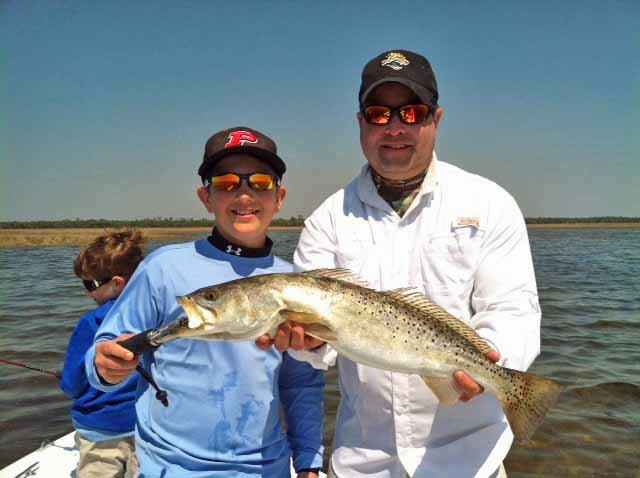 Sand trout have not showed up in numbers yet, but a few can be found in the deeper holes. Redfish action is steady but most are too big or too small. September is the beginning of the cooling off period, but don’t bank on the chill starting on day one. September is a gradual cool; a cool that that can still feel relatively warmish at the end of the month, but each degree downward is appreciated by those of us who work outdoors. 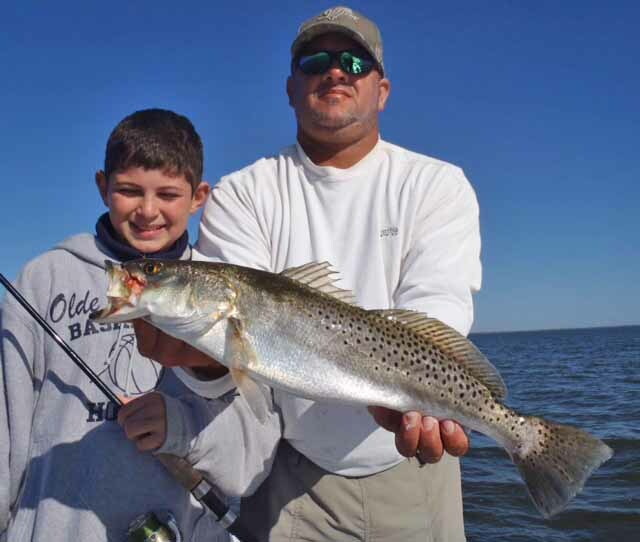 In a nutshell, fishing will be improving as the water temperature drops a couple few numbers. 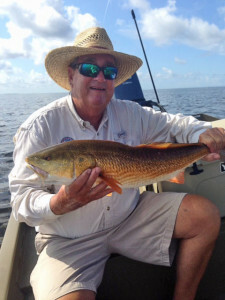 The red tide, that effected offshore fishing this summer, is reported by Florida Fish and Wildlife Commission to a patchy bloom moving southeast slowly. Local reports say the nasty conditions are very much improved and getting better each day. I believe the red tide situation is erasing itself day by day. 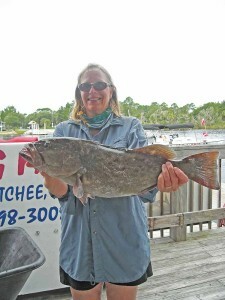 For the quick now, I’d keep grouper fishing inside the 45-foot depth. And while you’re there, take advantage of fantastic Florida snapper bite. A fried Florida snapper fillet is heaven on the tongue for every one. Scallop season will remain open until September 24th. During scallop season there is an unusually high amount of boat traffic on the grass flats. However, scallop hunters are prone to leave late and come in early, which means there are still great trout and redfish opportunities along the bank for those early rising fishermen or for those that linger in the evening. 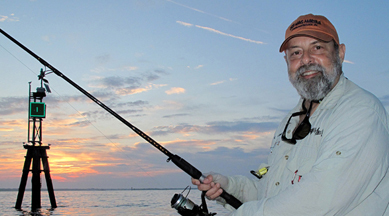 Be sure and consult tide chart before going fishing. Also, the outer banks, “Nine Mile” for example, are not run over during the day and the trout fishing is consistent. Always drift a small pinfish under a cork on the windward side with a semi-stout combo because you never know. Trust me on that. 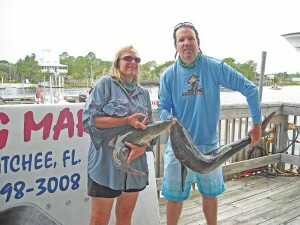 A day making gator trout or cobia is apt to take the candy. As always, if fishing is slow and you need a fish fix, go to hard bottom, drop down squid strips or cut bait to gather the ubiquitous and delicious Florida snapper. An hour of boxing fish changes attitudes. 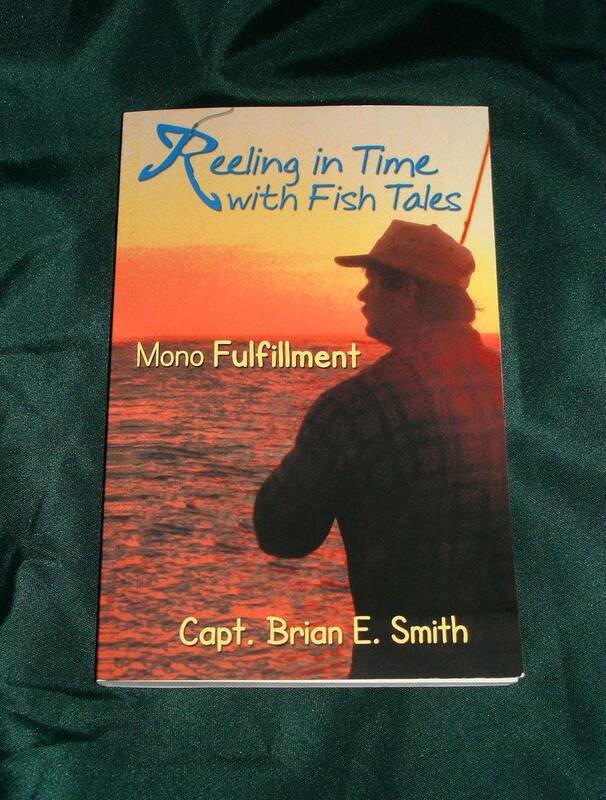 On Aug. 20 my new book titled Reeling in Time with Fish Tales – Mono Fulfillment was released. You can order from Amazon.com, www.syppublishing.com, BarnesandNoble.com and other online retailers, as well as some local stores. My book introduction pays homage to my Uncle Tom, who started me fishing while Dad was in Korea. The book begins with my dad taking me fishing at a lake for bream in chapter one. I age a little with each subsequent chapter, which details a different fish, experience and technique. Along the way I introduce you to folks who shared those times with me. Chapters are seasoned in humor and reality, and you’ll find out how I met my wife, Gina. I think the book will be a good read for most any single flushable seat-library, as well as, a gift for others and their own personal “libraries”. 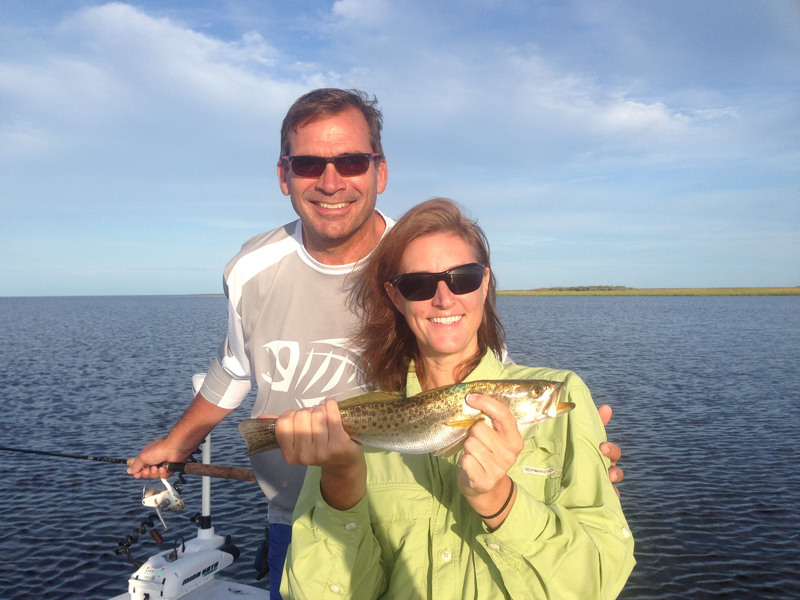 The fishing is steadily improving as we move into September. In 7 to 8 feet of water we are catching limits of spotted trout , Spanish , blues and sand trout . 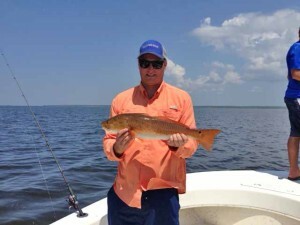 We expect the bite to continue to improve and some of the best redfishing is just around the corner in October. Scallop season continues through mid-September for those who have not had enough! Join us at www.hookedonreds.com in September as we move into fall for one of the best bites on the Nature Coast.